Aligned with the Common Core State Standards for speaking and listening, reading, and writing. This is a great introduction to the novel To Kill a Mockingbird. This activity is fun for the students and gets them interested in the book right away. They will be anxious to read it to learn the answers the the questions they come up with themselves. I provide a passage I wrote that the teacher reads and the students write the questions they want answered based on the reading passage. The passage is a nice tease, leading them into the book, but leaving lots of question marks. Students share their questions, then as they read the novel they will find the answers to their own questions. An excellent learning tool that is on-going throughout the novel. 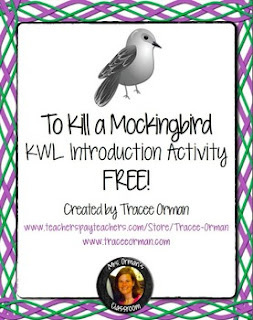 This is included in my To Kill a Mockingbird Teaching Unit.